We provide great selection and service. 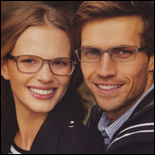 At Gopen Optical we know your time is valuable. Internet shopping has become convenient, easy and can provide a great selection of frames, much more than any one store’s inventory could hold. Let Gopen Optical Be Your Very Own Eyeglass Advisor Providing Expert Advice On Selecting Eyeglasses And Lenses. If you are looking or happen to purchase your frames on the web and want a second opinion, Gopen is here to help. We'll provide you with suggestions and recommendations as to the size, shape, fit and just how good they will look on you. We also specialize in customizing your eyeglasses. You can buy uncut lenses and for a fee our own optician can cut and fit them into your own frame. We're confident that once you stop by our shop, you'll be our customer for a long time to come. Our personal service and casual atmosphere makes shopping for glasses fun and affordable. We're a family owned business, with family values and a highly skilled staff. We specialize in complex prescriptions and offer the lastest technology and styles to get you the look you want at a price that will make you smile. "We Select Frames To Fit Your Face"
Gopen Optical ensures the peace of mind that comes from glasses made with a little TLC. We're happy to provide free adjustments and minor repairs for the life of the frame. Stop by or give us a call.